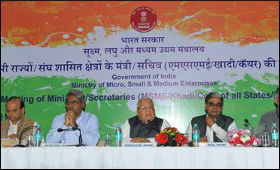 Union Minister for Micro, Small and Medium Enterprises (MSME), Kalraj Mishra Friday said that the coordination between center and states governments is essential for overall development of Micro, Small and Medium Enterprise Sector. A meeting of Ministers and Principal Secretaries (MSME/Khadi/Coir) of all States/ UTs under the Chairmanship of Kalraj Mishra, Union Minister for MSME, Government of India was held in New Delhi on Friday. It is a unique effort of the Government in line with its emphasis on the spirit of the cooperative federalism and discussions with the States/UTs. Kalraj Mishra, speaking on the occasion, said that, for overall development of Micro, Small and Medium Enterprise Sector, the coordination between Centre and State is an essential ingredient. This meeting is one such effort in this regard. There are numerous areas in which the effort of Centre can be, and need to be, complemented by the State and vice-versa, he added. Haribhai Parthibhai Chaudhary, Minister of State for MSME, Government of India, and senior officers of the Ministry were also present on this august occasion. Speaking on the occasion, Haribhai Parthibhai Chaudhary stated that India could become the manufacturing hub of the world if both Centre and States work in tandem. It may also benefit all the stakeholders. He also stressed on the huge potential of the MSME Sector in the matter of providing employment. He also pointed out that the present Government wants more people to be self-employed so that the number of job-seekers comes down. From the States/ UTs, Prof. Jagdish Mukhi. Lt. Governor, Andaman & Nicobar Islands, Rohit Bhai Patel, Minister from Gujarat, Vipul Goyal, Minister from Haryana, TH. Biswajit Singh, Minister from Manipur, H. Rohluna, Minister from Mizoram, Jogendra Behera, Minister from Odisha, Satyadev Pachauri, Minister from Uttar Pradesh and Madan Kaushik, Minister from Uttarakhand, participated and presented views of their respective UT/ States. C. P. Radhakrishnan, Chairman, Coir Board, and Vinai Kumar Saxena, Chairman, KVIC, were also present. (i) Government of India has given special attention to the Micro, Small and Medium Enterprises (MSMEs). The Budget of the Ministry has increased, at one go, by 87% during the Financial year 2017-18 as compared to that in 2016-17. Hon'ble Prime Minister has also mentioned about the facilities to the MSMEs in his address to the nation on 31.12.2016. MSMEs find a special mention in the Union Budget for the year 2017-18. It is well recognised that the employment is mainly provided by the MSMEs. (ii) It is, therefore, felt that various States must also focus on the development and growth of MSMEs. A few States have already created separate Department of MSMEs. All the States have been requested again in today’s meeting to create a separate Department or at least a separate Directorate for the development and growth of the Micro, Small and Medium Enterprises (MSMEs). (iii) Some of the States such as West Bengal, Odisha, Andhra Pradesh and Rajasthan have come up with MSME Policies in their respective States. Every State has also been requested again in today’s meeting to come up with MSME Policy in their States so that the MSMEs are encouraged. (iv) It has also been noticed that the major problem areas for the MSMEs are lack of availability of credit facilities, technology advancements, availability of skilled man-power, availability of infrastructure and also a prevalence of higher cost on regulatory compliances. All the State Governments have again been requested to work in all these areas, especially after the ease-of-doing business campaign. It is heartening to note that various States have simplified their processes and it would be appropriate that these processes are further rationalised, especially for MSMEs. 3. NIMSME, training of DIC staff and introduction of Udyog Bandhu: In the changed policy scenario, the District Industries Centres should be redeveloped as Udyam/Udyog Bandhus with the necessary infrastructure for providing counselling, mentoring and handholding services. A specialized cadre of trained officials employed by the Udyam/Udyog Bandhus need to work with local partners to counsel, mentor and to train small entrepreneurs. These Udyam/Udyog Bandhus can comprise of "Facilitator Business Development Cell as one stop services" to give counselling, mentoring and handholding towards complying rules required for setting up services or manufacturing enterprises. 7. Discussion regarding One-Man Committee's recommendations on MSME. c. Capital Investment Subsidy, Interest Subsidy and Benefits under the Purchase Policy by Govt. of Gujarat.